Other Products by Optimum Nutrition. 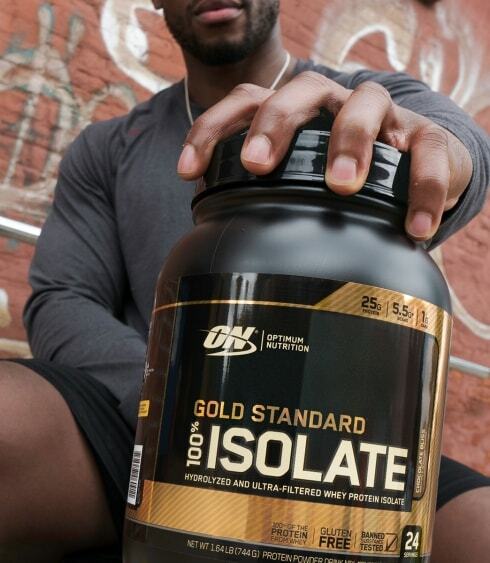 Search other Whey Protein Isolate (WPI) products. Optimum Nutrition have an exceptional range of sports nutrition supplements in their range. Their products are taken by a broad range of people, from elite athletes to the weekend workout enthusiast. 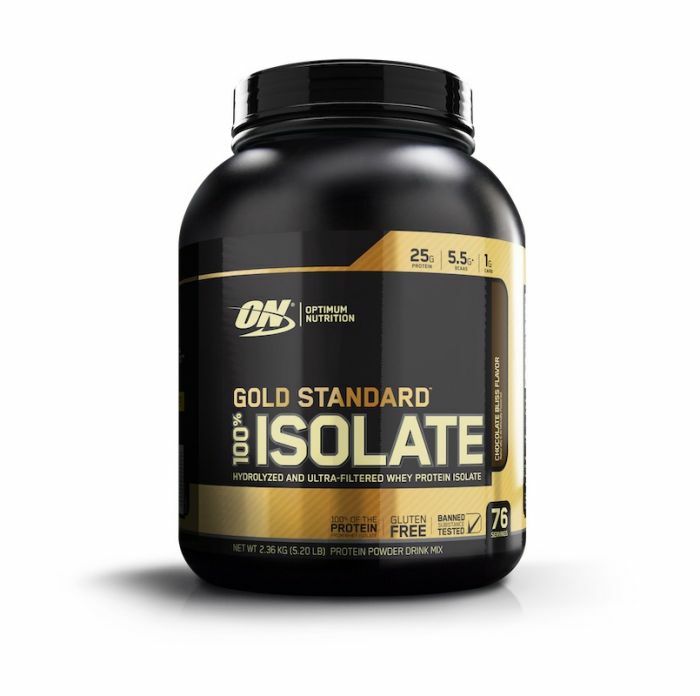 Gold Standard 100% Isolate is a premium quality whey protein isolate powder (WPI). WPI is known as one of the fastest absorbing proteins. This means, after consuming the protein shake, the amino acids soon find their way to the bodies tissues, including the muscles. This makes it ideal for recovery from exercise. The below diagram illustrates exactly what is removed from milk to end up with the final product: whey protein isolate. How Does Whey Protein Support Recovery from Exercise? Rigorous exercise, like weight lifting, can cause tiny tears in the muscle tissue, commonly known as micro-tears. Intense exercise also creates catabolic conditions in the body. This means, muscle tissue is being broken down. This muscle damage is important in order for it to want to adapt and change. This is where whey protein comes into the picture, as it provides a rapidly digestible source of essential amino acids, with a high proportion of leucine 1. Essential amino acids are needed to stimulate protein synthesis and return the body to an anabolic state after exercise 2. A high content of leucine allows for greater stimulation of mTOR in muscle tissue as well. This leads to even greater protein synthesis in the presence of the other essential amino acids 3,4. Once in an anabolic state, muscle micro-tears can heal much more rapidly. This is essential to optimum adapatation to exercise. We must admit, we're already big fans of whey protein isolates, especially hydrolysed products. But we will try to stay objective. Hydrolysed protein usually sits lighter in the stomach, and this product is no exception to that rule. It went down smooth and did not at all leave us feeling bloated or overly full. That's the beauty of a partially hydrolysed product. It's partially pre-digested. This makes the product feel lighter, digestion a lot easier and absorption even faster. We found the strawberry flavour to be nice, while the chocolate and vanilla were exceptional. We tried it in cold water, though flavoured protein does always tend to be nicer in full cream milk. So if you can spare the calories, give it a go, or maybe just as a once off on a cheat day. Important to remember, the fats and complex proteins found in milk will slow the absorption of the protein found in Gold Standard 100% Isolate, so water is always more effective for the rapid absorption effect. All in all, we we're extremely happy with this product. It gave us some much needed post-workout protein and left a nice aftertaste. We would rate this product 4.8 out of 5.0. Mix 1 Scoop with 200ml Cold Water and consume. Perfect for use after exercise. Alternatively, take 1/2 hour before exercise to assist anabolism or take between meals to further boost recovery. 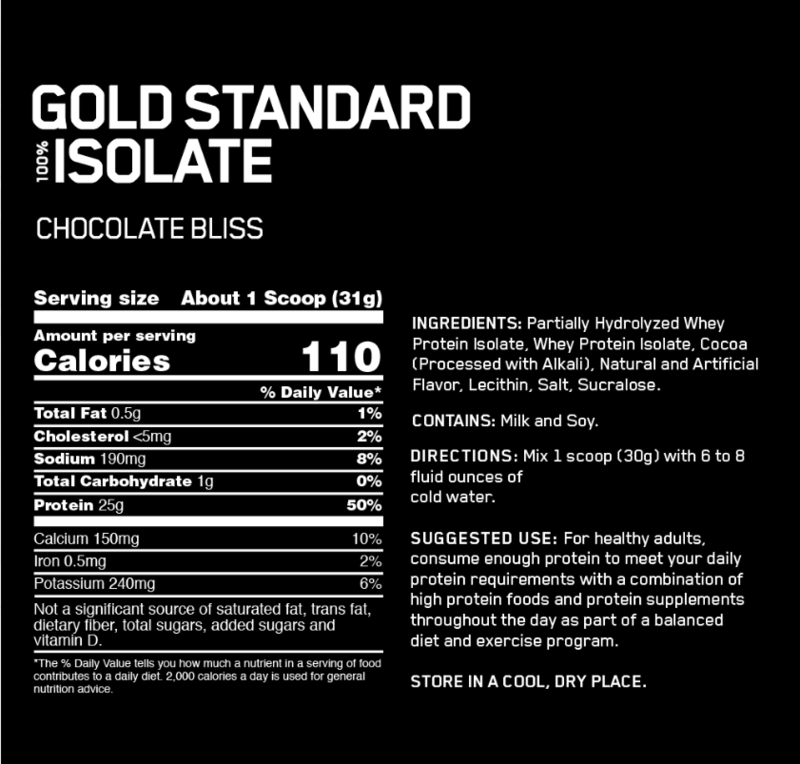 Not a significant source of saturated fat, trans fat, dietary fibre, total sugars, added sugars and vitamin D.
INGREDIENTS: Partially Hydrolyzed Whey Protein Isolate, Whey Protein Isolate, Cocoa (Processed with Alkali), Natural and Artificial Flavour, Lecithin, Salt, Sucralose.